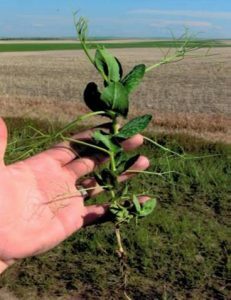 Field peas are a cool-season legume crop that are grown on over 25 million acres worldwide. Field pea or “dry pea” is marketed as a dry, shelled product for either human or livestock food. Field pea differs from fresh or succulent pea, which is marketed as a fresh or canned vegetable. 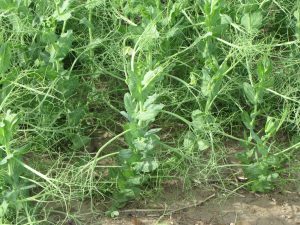 Field pea also may be grown as a green manure or green fallow crop. With either option, soil and future crop productivity will be maintained or improved. Use of field pea for green fallow instead of black fallow protects the soil from erosion, improves soil quality, substitutes water loss by evaporation or leaching from black fallow with transpiration through plant growth and exploits rotational benefits. Costs of tillage and idled land in black fallow are substituted with costs of field pea establishment and termination (at early flowering) in green fallow. Field pea in a green fallow system yielded 3,425 pounds per acre of biomass and 103 pounds per acre of accumulated nitrogen in above-ground biomass at the Carrington Research Extension Center during 1990-1992. Spring wheat averaged 39 bushels per acre over a two-year period at Carrington when grown without additional N fertilizer following green fallow as field pea or following black fallow. This demonstrates that wheat following pea green fallow can be as productive as wheat grown on black fallow, plus the numerous rotational benefits of the legume can be utilized.